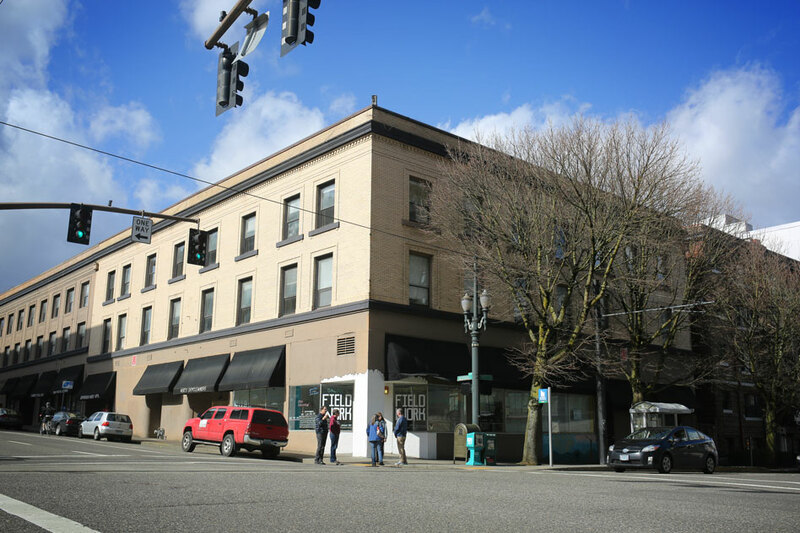 The drab brick building sits on the corner of Southwest 11th and Jefferson, empty and forlorn, its doors locked and its windows daubed with messages from its last tenant—a social-justice program run by students from Portland State University. Overshadowed by the sleek new towers to the east, it's the kind of building you'd walk past a thousand times without ever noticing it. Unimpressive as it seems, this building is Olde Reed, in the most literal sense. 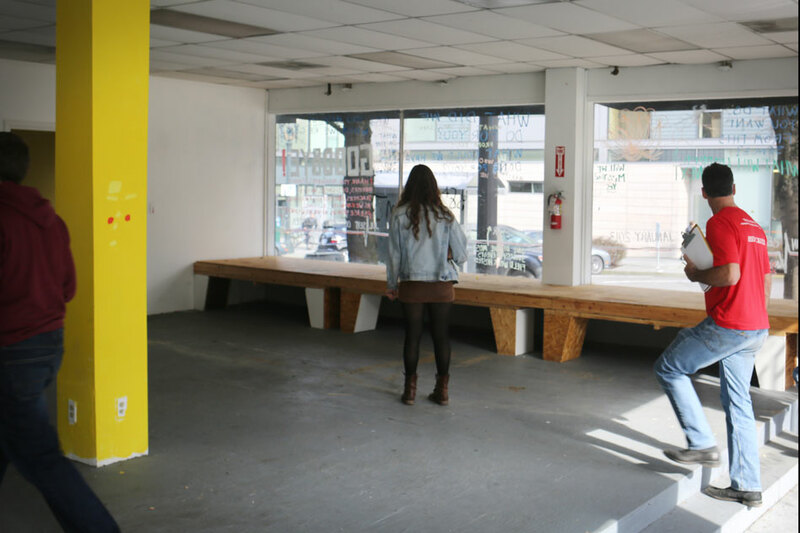 We came to explore Reed’s first building before it is demolished to make way for a 15-story apartment tower, which will most likely be more glam­orous than the last vestige of the original campus. Our group consisted of Mike Tes­key, director of alumni & parent relations; Mandy Heaton, Tom Humphrey, Laurie Lindquist, Chris Lydgate ’90 (editor of Reed), and Kevin Myers from public affairs; Gay Walker ’69 and Mark Kuestner from the Hauser Library special collections; and your humble correspondent. The superintendent let us inside the building now called Jefferson West. As my eyes adjusted to the darkness, I was greeted by the sight of broken mail­boxes and the musty smell of crumbling brick. 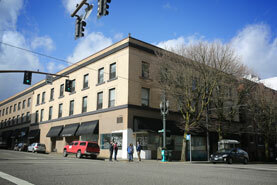 The building has under­gone many transitions since it left the hands of William T. Foster and his 50 students. 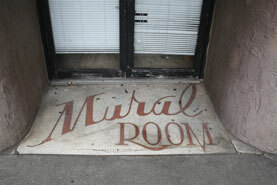 It was later home to the Cordova Hotel, the Mural Room, the Jazz Quarry, and an adult mov­ie theatre. The top floor includes 80 apart­ments which once provided living space for some of the city’s poorest residents. We poked around the poorly lit base­ment first, using our phones as flashlights and not finding much except rubble and old theatre seats. Heaton, however, hit the jackpot when she discovered a pair of hand­cuffs covered in faux tiger fur behind a torn couch with the key still in the lock—per­haps a relic from the theatre’s heyday. 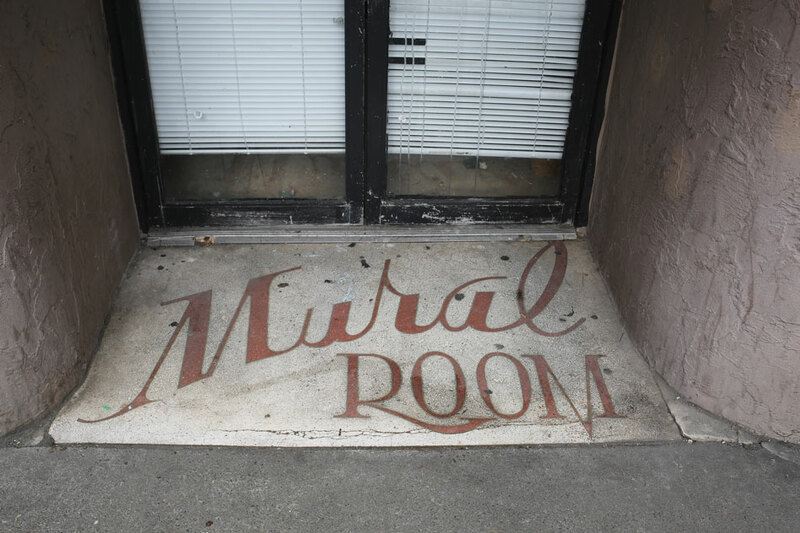 The building has been home to many colorful Portland institutions, including the Mural Room nightclub and the infamous Jefferson Theater. And who wore those leopardskin handcuffs? Yet, the roof proved to be unfruitful as for our quest, so we retreated back inside. At this point we lost most of our party, leav­ing just Lydgate, Myers, Humphrey, and myself to solve the final mystery: where was the original classroom? 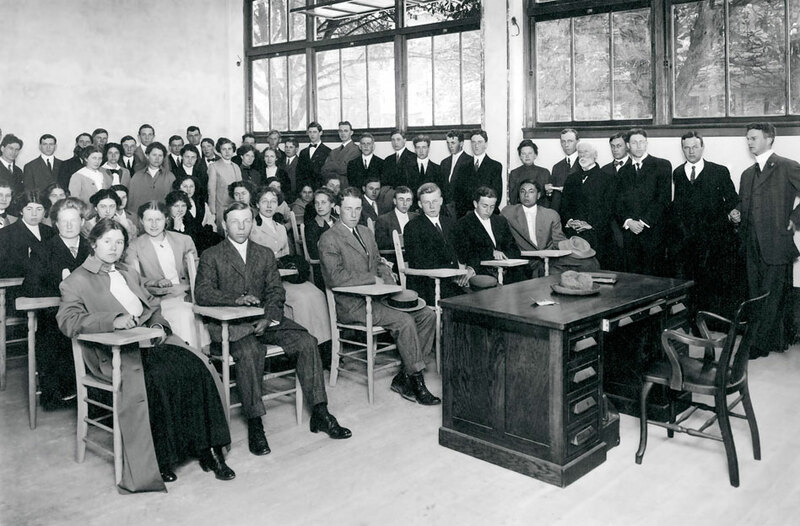 Using an old pho­to of students assembled for first day of class in 1911, we tried to determine the exact location of the original classroom. We were looking for a wide, tall space with columns, and win­dows that spanned most of the height of the wall. Humphrey noticed a tree behind the students in the picture, with several thick branches extending from the stump. The photo above was taken on the first day of Reed classes in 1911, on SW Jefferson Street. Does the photo below show the same classroom? The last room we visited had been used by PSU students for a field study program. It was empty, except for the several columns that punctuated the space, with light streaming in on all sides from the ample windows. Was this perhaps the classroom? As we pondered I glanced outside and noticed several trees lining the street. The trees were reminiscent of the one Humphrey had seen in the photo and, upon closer observation we could see where orig­inal, lower, branches had been cut to pre­serve new growth. The romantic in me likes to think that we did find the original classroom, and that its final use, in a continuation of the tradi­tion, had been as a classroom. As we left the building and walked away from Olde Reed, we realized that we were the last Reedies to set foot in the same space used by those pioneering 50 students on the first day of classes. When they listened to President Foster give his opening speech, they could not have known that they were beginning something that would continue more than 100 years later, in a room that their academic ancestors would enter for the last time one sunny Friday in 2014.